As a music teacher, I have NO experience teaching labs. This is where you can really benefit from turning to your colleagues for help. If you don’t have a formal STEM teacher in your school, try teaming up with a science teacher for an interdisciplinary unit. If not, do not fear – you can do it! The internet is full of resources to help! Do a quick search for “science of sound lesson plan” and you’ll find a wealth of information. 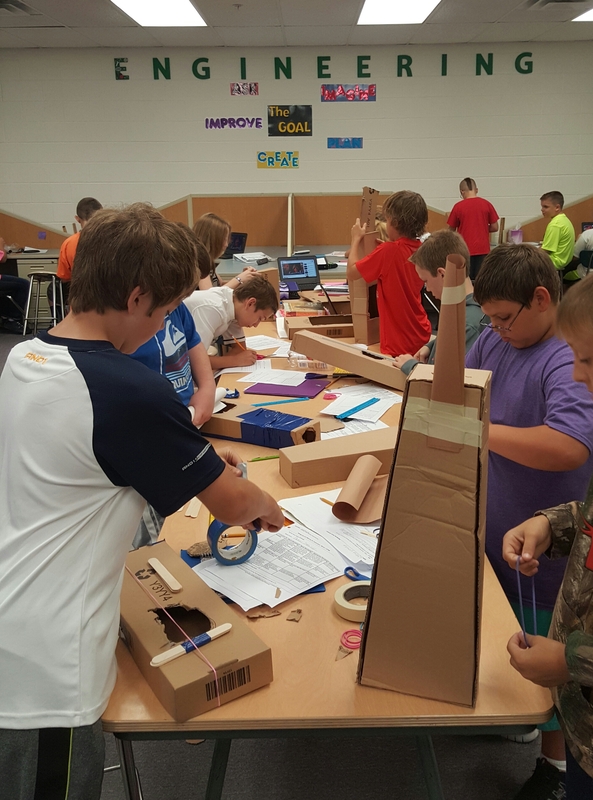 After the challenge of creating an “instrument” with limited supplies, students spent a day learning about the science of sound. This day (or the entire unit) wouldn’t have been possible without the expertise of our STEM teacher – who very conveniently used to teach sixth grade science. 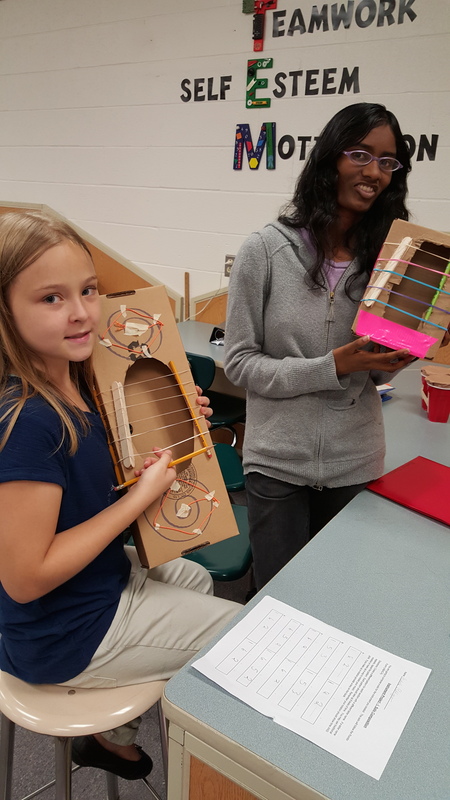 She provided two great labs for our students to see, hear, and create sounds while making connections to the science behind them. 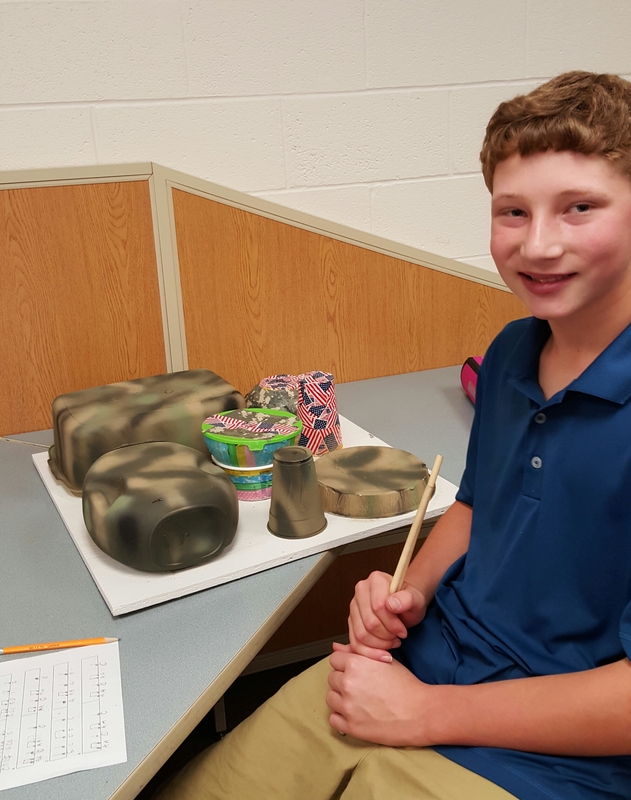 This lab, from Explore Sound allowed students to discover how frequency effects pitch. 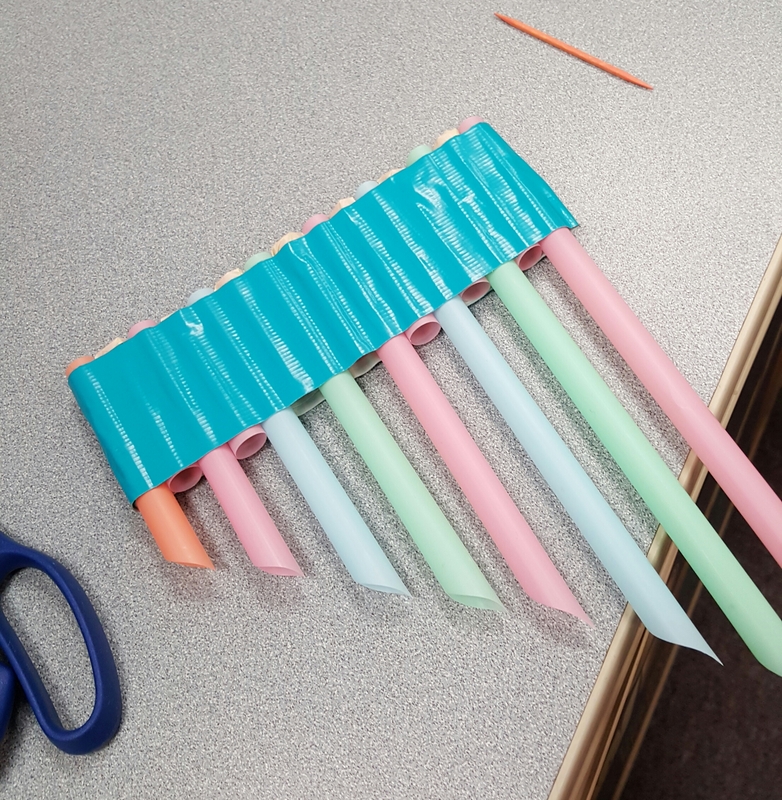 (Note: We only did the activity portion of the lesson plan) Each student had his/her own tuning fork to record the frequency and listen to. 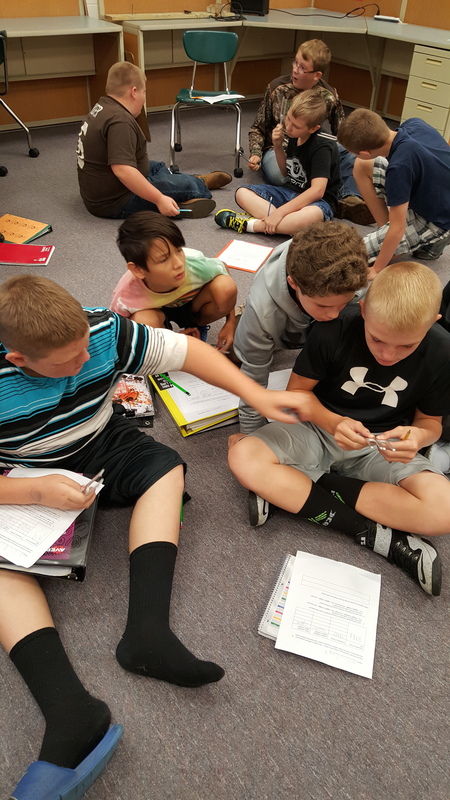 Students LOVE playing with tuning forks – something about SEEING and FEELING the vibration against various objects fascinates them! After recording the data about their own tuning fork they compared it to the forks of five other students, noting if the length was longer/shorter and if the pitch was higher/lower. The students then drew conclusions about how length and frequency effects pitch. Finally, they dipped the tip of a ringing tuning fork into water for a surprise! 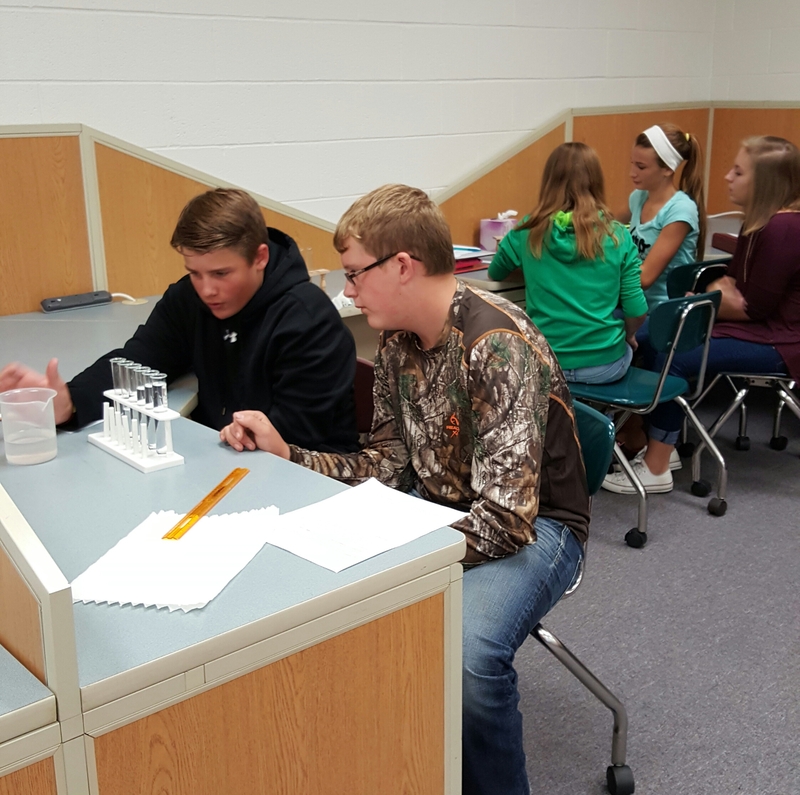 Students were given 8 test tubes and poured varying amounts of water into each one, measuring for accuracy. They then blew across the top of each tube and arranged them in order from the lowest to highest pitch. 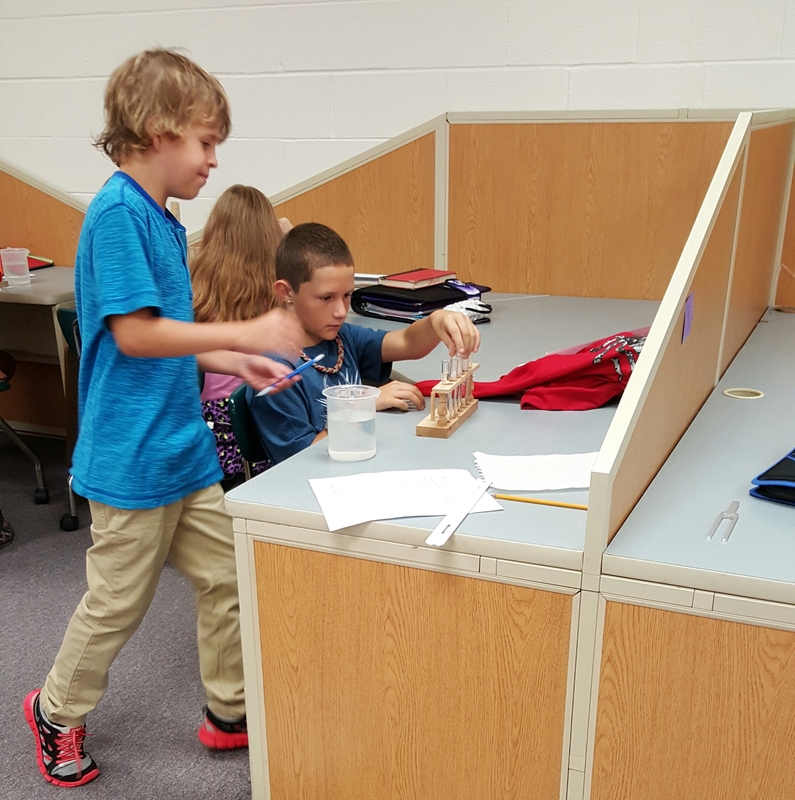 Students concluded the less water a tube held, the lower the sound, due to the longer column of air for vibration. 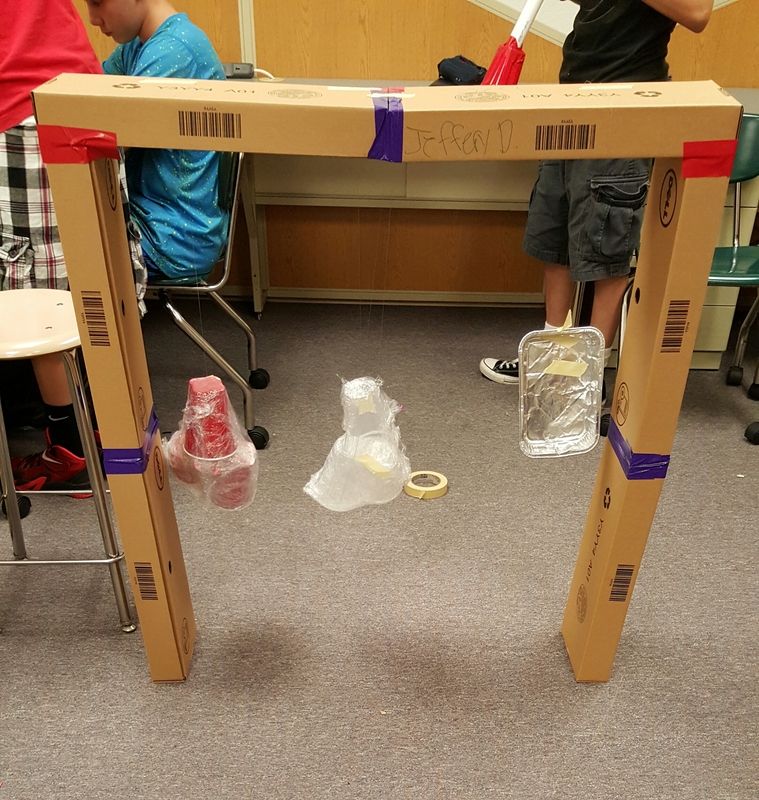 The basis for this lab came from the school’s old science text book series. Students completed lab sheets for each lab where they made predictions, collected data, and drew conclusions. 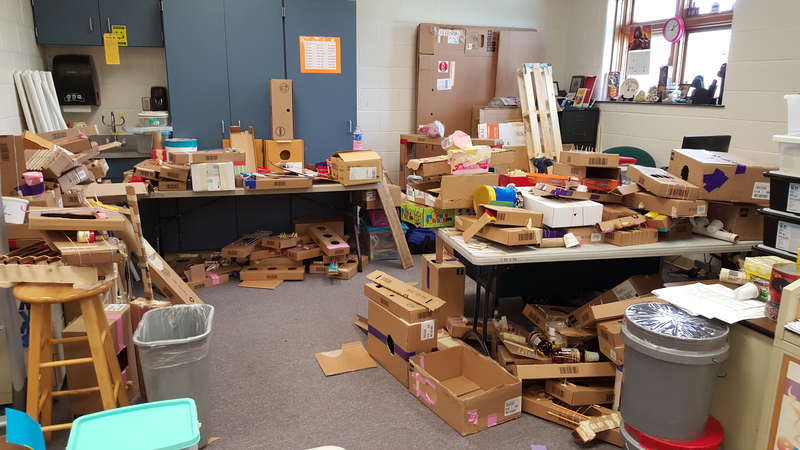 These labs provided a basis for student understanding the science of sound when they start building their instruments. 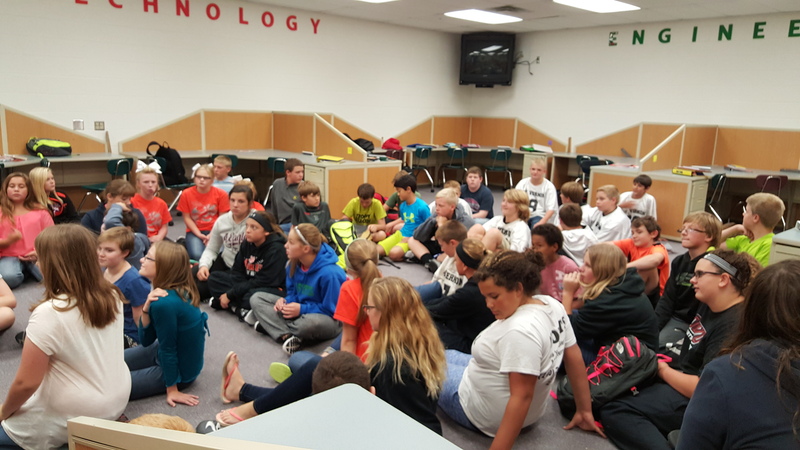 Combined classes for our first meeting in the STEM room. 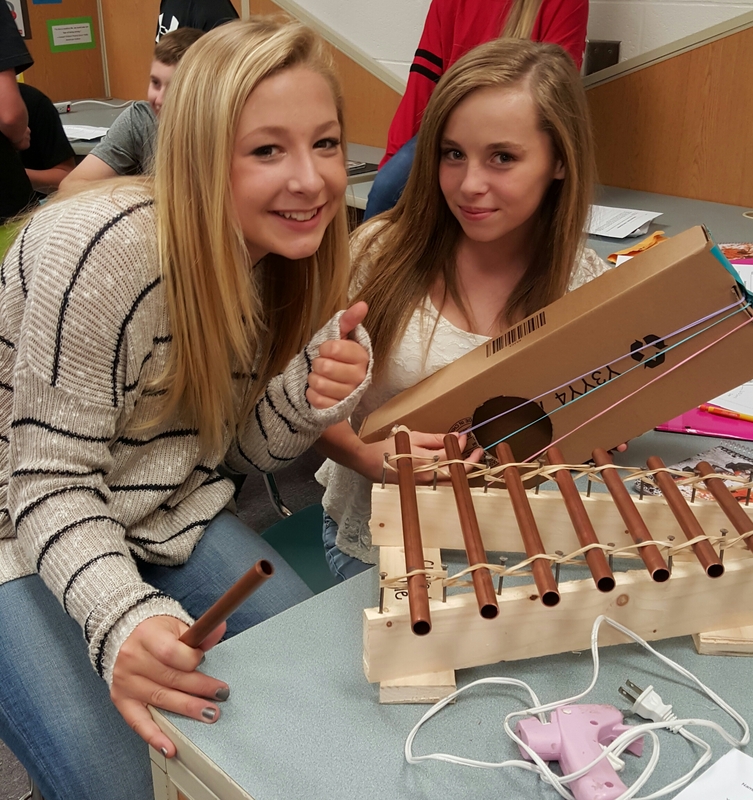 This week the Music + STEM class teamed up with the STEM class to create an instrument, compose, and perform. This combo meant a lot of kids, noise, materials, and most importantly – learning! We started our first day together with this video about the Landfill Harmonic project. 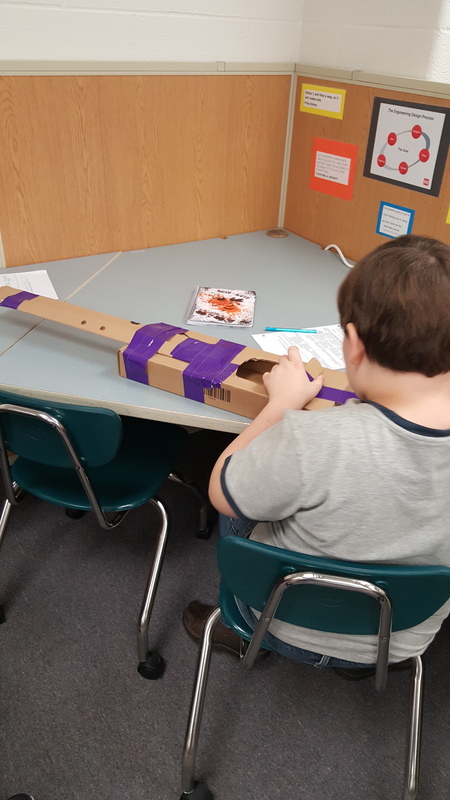 Students were asked to notice the materials used to create the instruments and the effect the instruments and music had on the people involved. 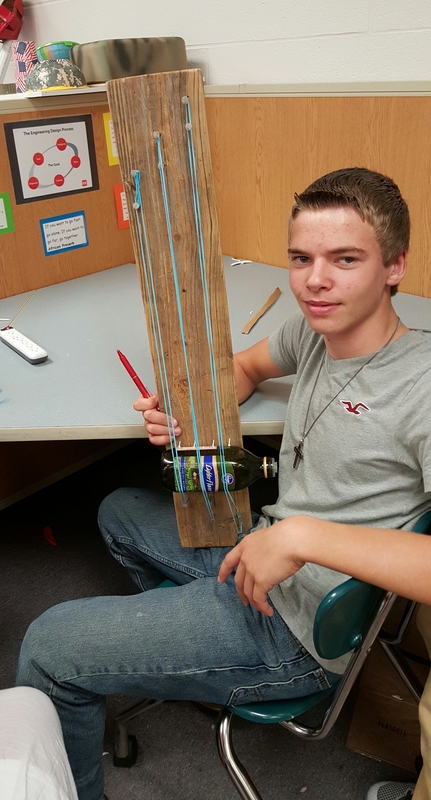 Hopefully, this helped students realize that making instruments from found materials isn’t just a fun activity – it could change someone’s life. 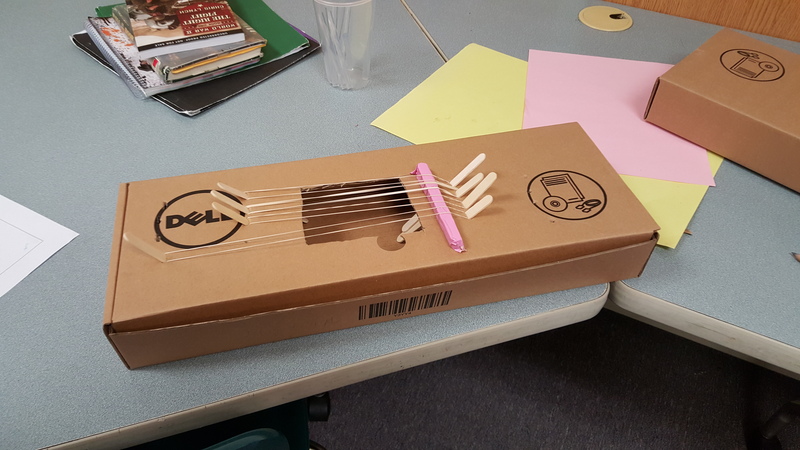 We then presented students with a challenge: In 10 minutes, create an instrument out of any or all of the provided supplies. 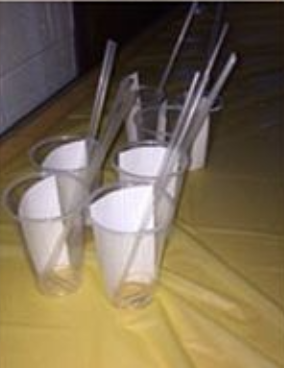 Pairs of students were given a cup, 2 straws, 2 paper clips, a rubber band, and an index card. This was a sometimes noisy day (as you’ll see in the video clip below) but a great intro to the creative thinking process that will go into creating something bigger and better!